Twinfield is an accounting application to which you can send a direct data export from within Operate. Using your Twinfield credentials, Operate will automatically send your transactions with no need for you to do this manually or use a data file. Before exporting, please back up your Twinfield data if possible. Run the Un-booked items by revenue code report, which allows you to see whether your existing products have an assigned revenue / GL code. Run the Un-booked invoice summary report. This lists all of your currently un-booked invoices and lets you see the total amount which should be added to your Twinfield balance. Check the Total amount listed by the Un-booked invoice summary report and make note of it. This should be the total amount by whhich your Twinfield sales account should increase after export. To start running your export, go to Invoicing > Twinfield Export. If you don't see this option, go to Settings > Integrations > Invoicing and install the 'Twinfield Export' app. Once installed, click Open or go back to Invoicing > Twinfield Export. Select Already got a Twinfield account? Get Started!. 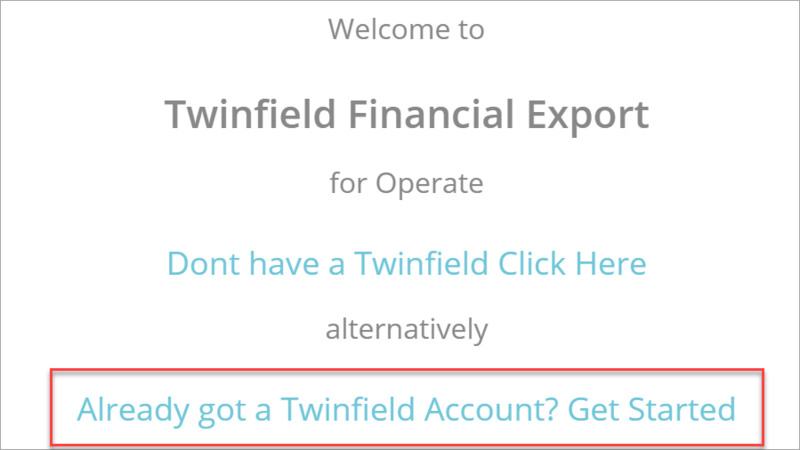 In case you do not have a Twinfield account, simply select the corresponding option to create one. In this guide, we will start from an existing account. Select what you would like to export: Choosing Unbooked Transactions will export transactions that would not have been exported before. Booked Transactions may already be exported. Exporting booked transactions may lead to duplicates in your financial accounts - please use this option cautiously and only if you need to correct any errors within the export (e.g. if you need to make changes to any record after having exported). Read more about booked and unbooked statuses. Your export is now ready - Pleas make sure again that your Twinfield data has been backed up, then click Yes if you are sure you want to export. All selected transactions will be marked as booked in Operate and exported to Twinfield. If you would like to view a history of your Twinfield exports, please go to Invoicing > Twinfield > Select your Organization then click History. Here is where you will see a list of any previous exports as well as their current status (successful or finished with errors) and type of exported transacrtions. Click View to see more details about a particular export. On the export view, you can see a list of exported transactions, as well as whether they have been successfully exported or not. Click Download detailed error log to generate a .csv file containing a full list of your transactions and their export status. Failed transactions will come with a failure reason, which you can correct in Operate. Failure is often caused by a missing revenue code, unmatched tax or account codes. So, for example, if an invoice or payment is not exporting because of the revenue code, all you need to do is go to Space > Products, make sure the code is correct on the invoiced product. Read more about managing products. Once you do this, go to Invoicing > Invoices and unbook the invoice in question. You can then rerun the export. If you are having issues correcting export errors, please contact our support team using the chat function. To re-export, follow the same steps above, but select to export booked transactions, then choose custom transactions, where you should find and select the one(s) that failed. After the export, the sales account balance should be the sum of the starting balance and the Unbooked Invoice Summary Report total.